Between 35 and 40 tonnes of unwanted steel tools and appliances are ending up at Christchurch’s EcoSort plant each month because people are incorrectly putting them in their recycling wheelie bin. “Old steel tools and appliances don’t belong in the recycling bin as they cannot be processed at the EcoSort plant in the same way empty tins or bottles can," says Christchurch City Council Solid Waste Manager Ross Trotter. “If they accidentally get into the EcoSort plant they can damage the machinery and cause it to breakdown." It is best to take unwanted steel tools or appliances to EcoDrop recycling centres at the transfer stations or to a commercial scrap metal recycler. Mr Trotter says other troublesome items that routinely turn up in the kerbside recycling collection include shoes and clothing. "The recyclables we collect at the kerbside aren’t manually sorted – the sorting is all done by machines. If shoes or clothes get into the machinery, they can get wrapped around it and cause major problems. “Please take any good quality clothes that you no longer want to a charity clothing bin so they can be put to good use. They are unable to be reused once they have been in the collection truck," Mr Trotter says. 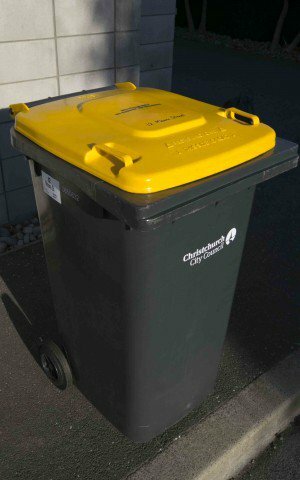 The Council regularly conducts bin audits to check only acceptable materials are being put out for kerbside collection. Your bin will not be emptied, if unacceptable items are found in a bin. Instead a contamination sticker will be placed on it, advising of the unacceptable items. The bin may be removed if the contamination continues. You can take your recyclables to the recycling centre at the EcoDrop for free - if you are struggling to fit all your recyclables into your yellow wheelie bin. Alternatively you can get an additional 240-litre recycling bin for an extra $39 a year. Apply online to get a bigger recycling bin.